The Instruction Manual by John Ashbery is a poem of some 74 lines, which mentions more than 30 colours. And these colours evoke Guadalajara, Mexico, a place the speaker hasn’t even seen. But having said that, he pictures it well. His senses appear to have been sharpened by the deadline for a technical writing gig, and they soon take flight through an imaginary window. 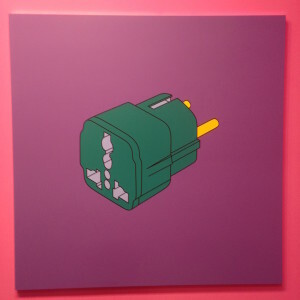 Michael Craig-Martin is, in his turn, something of a technical illustrator who makes a lively escape into colour. Here you see a sherwood green adaptor with sunny yellow tines and a blood-red interior. There is nothing naturalistic about this; it is as oneiric as the journey to Mexico in the poem we’ve already seen. But the pleasure is anchored in the familiar form of a travel appliance. What is it about precision, in writing or draftsmanship, that sets off the imagination? Is it the fact that in both these disciplines, colour is proscribed, a banned and hallucinatory substance. What with the smoke alarm. the memory stick and the hotel door handle (all of which feature alongside this adaptor), Craig-Martin never makes it out of his room. No en plein air for him. And so, much of the show suggests the paraphernalia of travel, and this survey reads a little like the difficult third album of a rock band who only write about life on the road. I jest. There is a case to call this pop art. And I think a more difficult case to compare it with photorealism. Certainly it shares some of the powers of observation, some of the decision making. Craig-Martin talks about this with artist Liam Gillick. He plays down the role of invention in art, in favour of observation. Gillick meanwhile downgrades inspiration in favour of visual choices. It is a fascinating discussion and well worth a look if you pick up the catalogue. If nothing else the beautiful 120 page book will give you something to cling to. Like a plug socket in Guadalajara. Michael Craig-Martin: Transience can be seen at Serpentine Gallery, London, until February 14 2016.